Oh Rebels, why are you making it so difficult for me to love you every week. If this keeps up, I think we will need to go to couples therapy to sort out my feelings on this show. We are four episodes into this final season and you’ve already acquired a long list of fresh and unsqueezed raw Star Wars awesomeness, but you’ve used that in all the episodes as a crutch for the rest of the show to stand on. 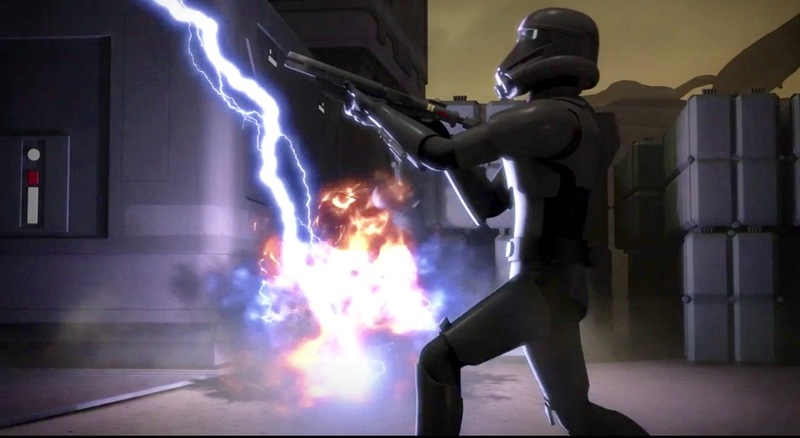 Last week we had a flawed but suitable and possible conclusion to the epic Mandalore saga which had Mandos shooting rocket jetpacks at TIEs. This week we return with basically a prequel to Rogue One featuring lots of Saw Gerrera, Mon Mothma, U-Wings & even some laughs with the world’s sweetheart, Two Tubes! While there’s no denying the coolness of the simple fact that we are are getting animated versions of all these beautiful things, they constantly upstage and overshadow the characters this show is supposed to be about. 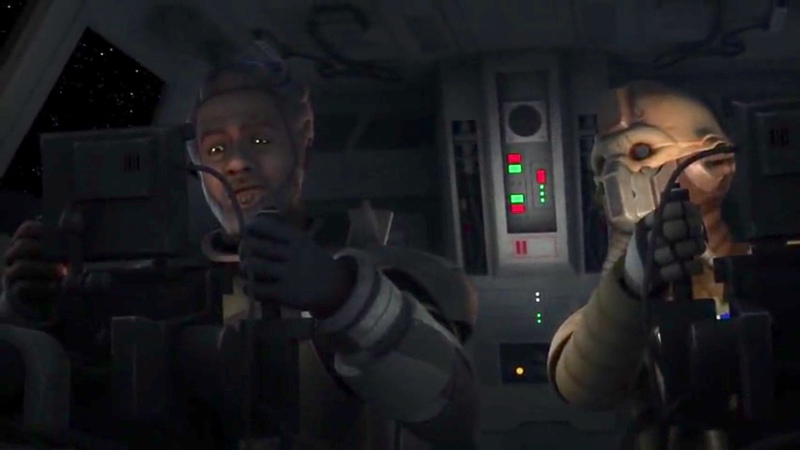 This season more than ever feels like the Rebel Alliance aspect of Rebels is in red and underlined, but with only a handful of episodes left and some very big questions about what happens to who that need to be answered, I just wonder if this is the time or place for the Saw Gerrera Hour. Which physically hurts me to write that as i really did love it so much. Maybe just give Saw his own show? The New Adventures of Saw Gerrera? With his sidekick Two Tubes! 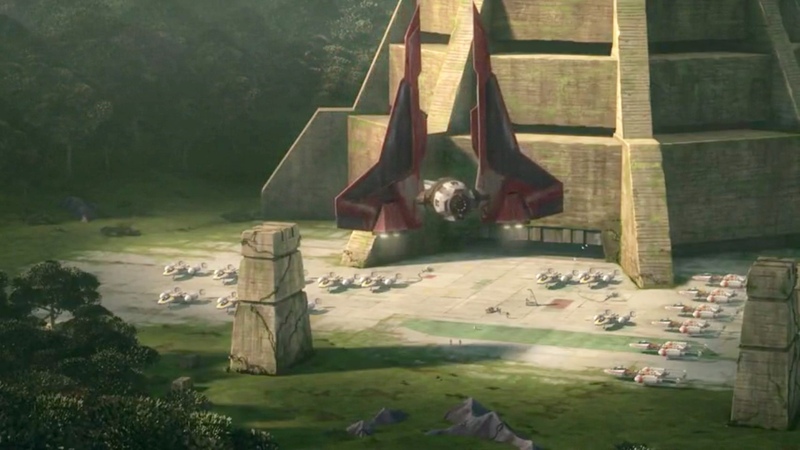 Anyways, the basics of this two parter finds the Ghost crew meeting up with Hera and Zeb at the new secret base on Yavin IV. 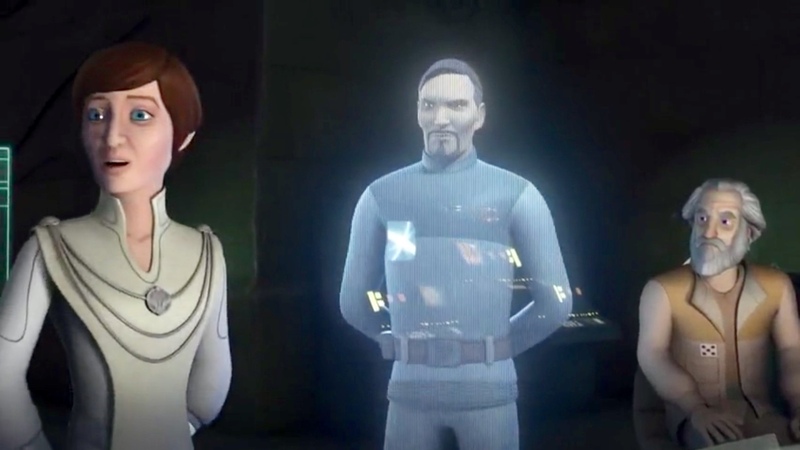 There we quickly are greeted by the new Rebel, Hot Kallus and then it’s straight into the planning room with Mon Mothma and a sweet hologram of Bail Organa. Clearly, this is all Star Wars gold so far. There’s some stuff about a mission to head to giant Imperial Radar Dish and Sabine, Ezra and Chopper volunteer to go all 2009 Star Trek and dive down to the dish. Naturally, things don’t go quite as planned and they are picked up by Saw & Two-Tubes who somehow are flying around in a presumably stolen Rebel U-Wing. Let me back up here and talk about a scene with Saw that happens a little before the radar dish mission. It’s nighttime at Yavin and mysterious droid suddenly begins projecting a GIANT hologram of Saw’s head basically telling all the Rebels on Yavin that they are a bunch of babies and that the only true way to fight the Empire is to fight dirty. Out walks Mon Mothma and the two of them have a brief but juicy debate over the morals of war. Written by Rogue One co-writer Gary Whitta, this is an amazing moment that makes you look at both Saw and Mothma’s roles in Rogue One in a whole new light. 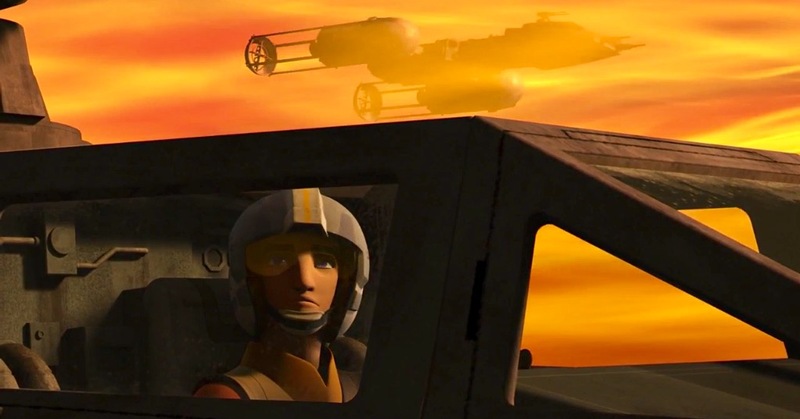 The thing that bums me out with scenes like that is thinking about how a moment that strong and with that much Star Wars heaviness is the kind of thing Dave Filoni and crew seem to have such a hard time harnessing into our main Rebels characters. Major things happen to these people, but feel quickly passed by in sometimes the very next episode. Week after week, the show’s best moments are often left for characters that have been borrowed from Star Wars films, books or Clone Wars. 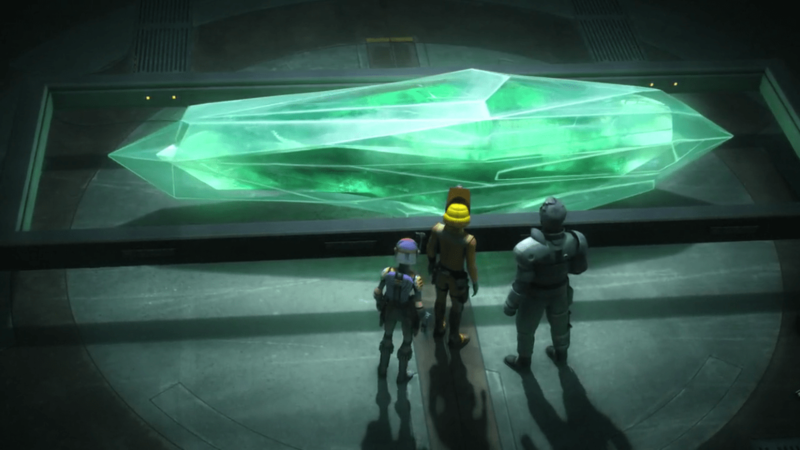 As the episodes go on, Saw’s quest to discover the secrets of the Empire deepens as he finds a gigantic Kyber Crystal (perhaps the same one last seen in the unfinished Utapau arc of Clone Wars) and sees the awesome power of the Crystal when it is used as weapon. Ezra, Sabine and Chopper make it back home and once again probably learn that family is the greatest power there is or something. When I think about this seemingly epic two part season finale for Rebels, that’s about all I can come up with. I keep telling myself that I should have enjoyed this grand conclusion to season three more. It’s got everything I would want in a biggie size episode with massive space battles, ground battles with a Phantom Menace shoutout shield generator, Mandos shooting rockets out of jetpacks and a Force moose that becomes a giant pissed off cloud. Sound amazing, right? After three viewings, I’ve admitted to myself that while I’m far away from calling this one a stinker, I’m just not that into it and there’s a few good reasons why. The episode could be subtitled The Thrawn Strikes Back as most of it is watching our Rebels get a beatdown in space and on the ground from Thrawn and the Empire. While the space battles are the best we’ve seen in the show so far, the fact that the jaw dropping space battles from Rogue One are still so fresh in our heads opens up some unfortunate comparisons. 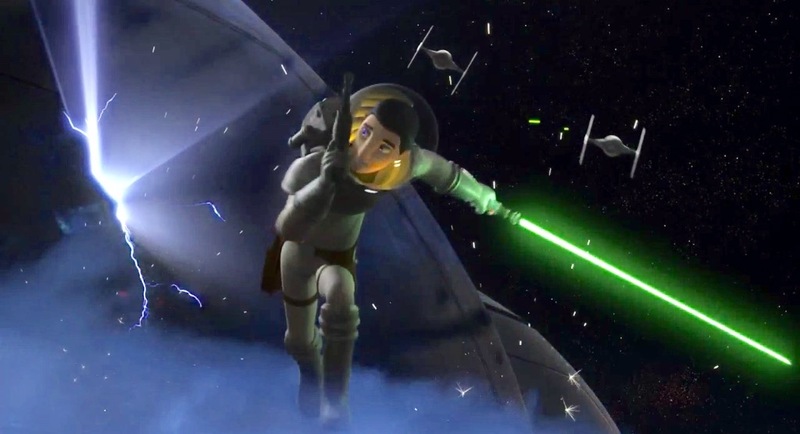 One of the episode’s biggest moments should have been Commander Sato’s brave sacrifice as he rams into an Imperial ship with the Phoenix Home ship. It’s a scene that should have played as gut punching reminder that the Rebellion will sacrifice everything or the cause. 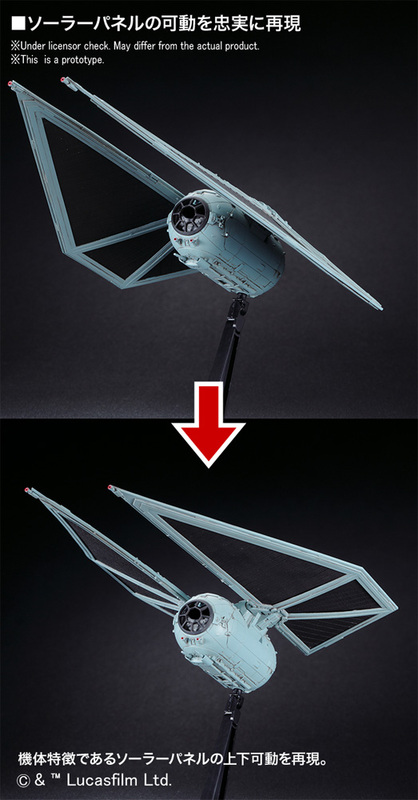 Instead the bit pales in the deep shadow of the similar and way more effective Hammerhead Corvette moment in Rogue One. Not helping the Rogue One comparisons is the inclusion of the Death Troopers in this episode. These lanky undead elite troopers were breakout stars in Rogue One and while they get to run around in the episode’s ground battle, we never get to hear their garbled voices or see them do anything too interesting here. If Zero Hour would have given them just one moment where they have an opportunity to shine or be the unstoppable ghouls they’re supposed to be, we’d all still be screaming and getting Death Trooper tattoos on our arms. In a move that absolutely everyone predicted, Sabine comes back with the Mandalorian crew but now you have to wonder, is she back for good? What does this mean for the fascinating story the show began for her this season? And what of Kallus? Now that he’s gone from the Empire for good, what role will he play in the future of the Alliance? Will grumpy cloud Bendu play into anything again? Is he still mad at Kanan? And while Thrawn did possibly win the battle here, a lot of the Rebels did manage to escape his grip for what maybe was the 157th time. He’s a character that becomes more and more compelling with every episode, but the threat from him has to get amped up in season four somehow. 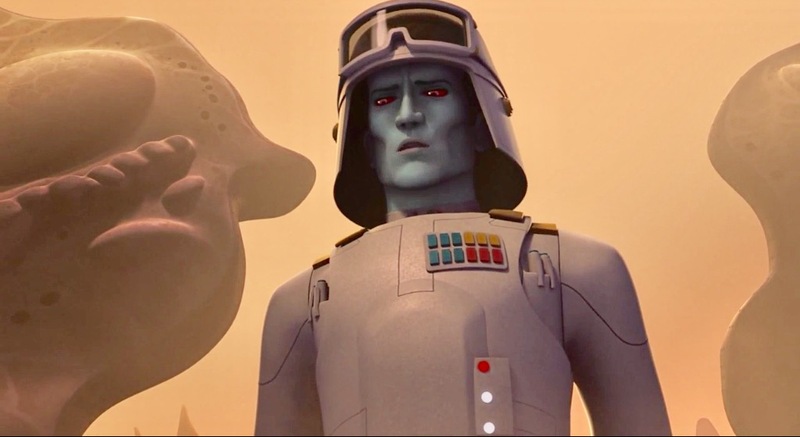 But please Thrawn, keep wearing that goofy helmet. It really suits you. 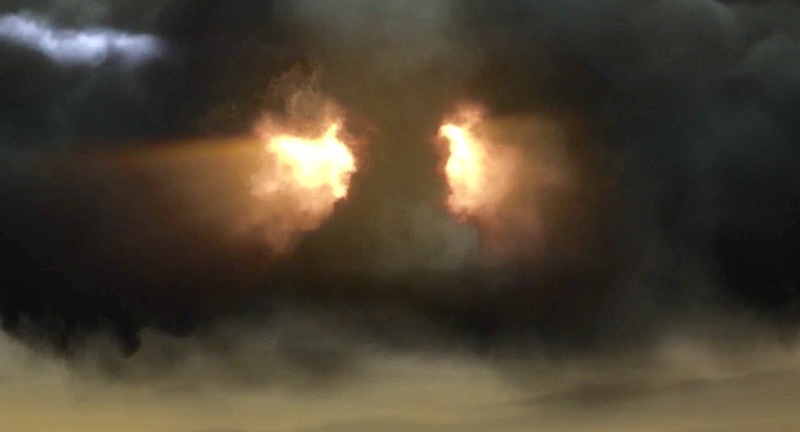 Another item haunting this episode is that just one week before it aired, we had that little thing called Twin Suns. That was the episode that had everyone and their next door neighbors theorizing on who the Chosen One was and talking for hours about Obi-Wan Kenobi’s battle stances. Love it or hate it, much like last season’s finale, “Twilight of the Apprentice”, it was a hot button moment for Star Wars fandom. Sadly, with Twin Suns still being debated and discussed, Zero Hour just feels like an afterthought. The whole episode plays more like what we’d expect from an epic two part season opener that begins the season with an energetic bang. 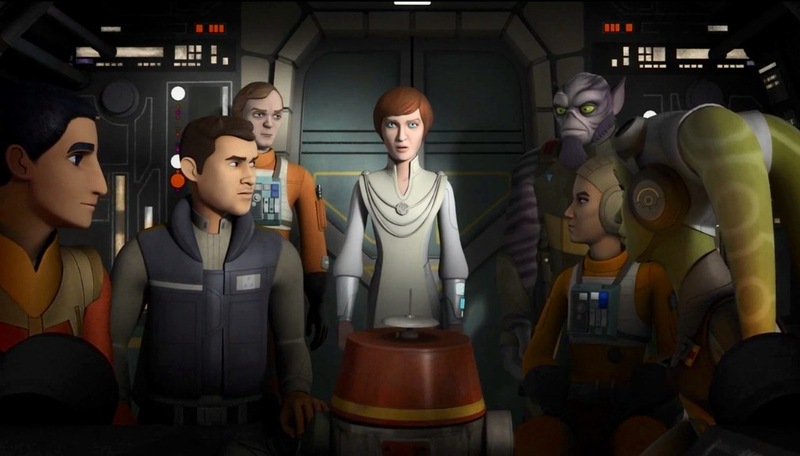 This is an episode with a lot of fun and cool moments, but none of the game changing moments we’d gotten so spoiled on with previous Rebels season finales. Yes, this episode delivers some cool Star Warsy moments but do characters develop at all over the course of this two parter? 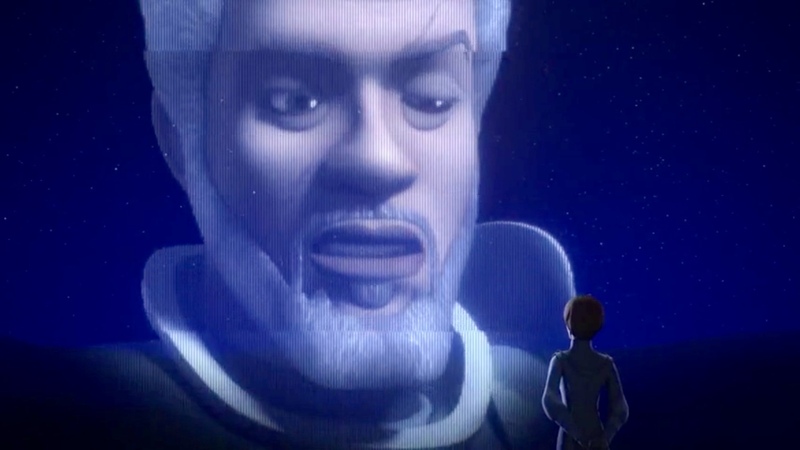 There’s a lot of love in this episode and a lot to be excited about for next season, but Star Wars Rebels just got lost in it’s own shadow here. Way back when Star Wars Rebels was first announced in May 2013, it came with the lofty promise that it would present the roots of the Rebel Alliance and the birth of the Galactic Civil War. That was enough to make fans like me stare at themselves in a mirror for a few hours wondering how we be able to handle that level of outrageousness. That also led some to believe that the first episode of Rebels should feature Wedge Antilles and a squadron of X-Wings shooting proton torpedoes at The Emperor as he woke up from his afternoon nap. As fantastic as that way of thinking may have have been at the time, it wasn’t quite what Dave Filoni and his talented team had in mind. The series has been a slow build that has had its own distinct voice while it wrapped up threads from Clone Wars and brought us closer to the period in Star Wars history we saw in Rogue One and A New Hope. 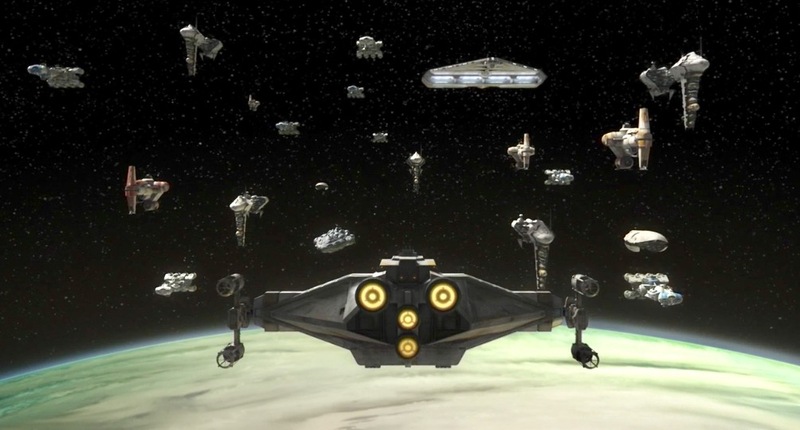 The line to that momentous era got a little straighter with Secret Cargo as Rebels soared like a U-Wing over Scarif with yet another standout episode. Maintaining that tricky balance between storytelling and fan service has sometimes been tricky for Star Wars and has caused a few Rebels episodes to be stopped right in their tracks. Secret Cargo walks that tightrope with it’s eyes closed and with a freaking hula hoop around it’s waist. Rattling off all the awesomeness in this episode is enough to make a Star Wars fan’s nose bleed and pass out. There’s Y-Wings bombing stuff, the wonderful Genevieve O’Reilly back as the voice of Mon (Hey Mon!) Mothma, Jon “Gold Leader” Vandor, Rebel Pilots in the classic orange jumpsuits! Seriously. Just even typing that makes me sweat. Even with all that Old Country Buffet style embarrassment of Star Wars riches, the real highlight comes at the episode’s end as Mothma tells Palpatine where to stick it with a defiant speech that cements the formation of an alliance to bring that old Sith Lord down. As Mothma delivers her speech, we see all the different sects of the still mostly unformed Alliance watch and get inspired to take that next step. Good thing they didn’t show Raddus and Ackbar watching her on Mon Cal as I now would be writing this review from heaven. Though I loved this episode almost as much as pumpkin pie, the fact that Ezra was able to just jump into a Y-Wing, fly it like a champion and start bossing everyone around kind of bugged me. I like ya, Ezra but you’re no Luke Skywalker. I get in the end the show is for kids but why does Ezra always have to be the one who does EVERYTHING in every episode? We have GOLD FRIGGIN LEADER here! Let that guy who is a legit living legend, get busy on those TIEs. As we come into the home stretch here with season three of Rebels we are getting to that era of a base of Dantooine and the Mon Cals joining the fight. With a first look at Rebels season four and beyond at Star Wars Celebration in a matter of weeks, the future looks brighter than a pair of twin suns for the show and the Ghost Crew. Episode 61 – We love the Star Wars Read Along books & records. Let’s begin now! This is story of Jason & Gabe listening to the Star Wars Read Along books from the 70s and 80s. You will know it is time to turn the page when you hear R2-D2 beep like this – beep-boop-waa-weeo! 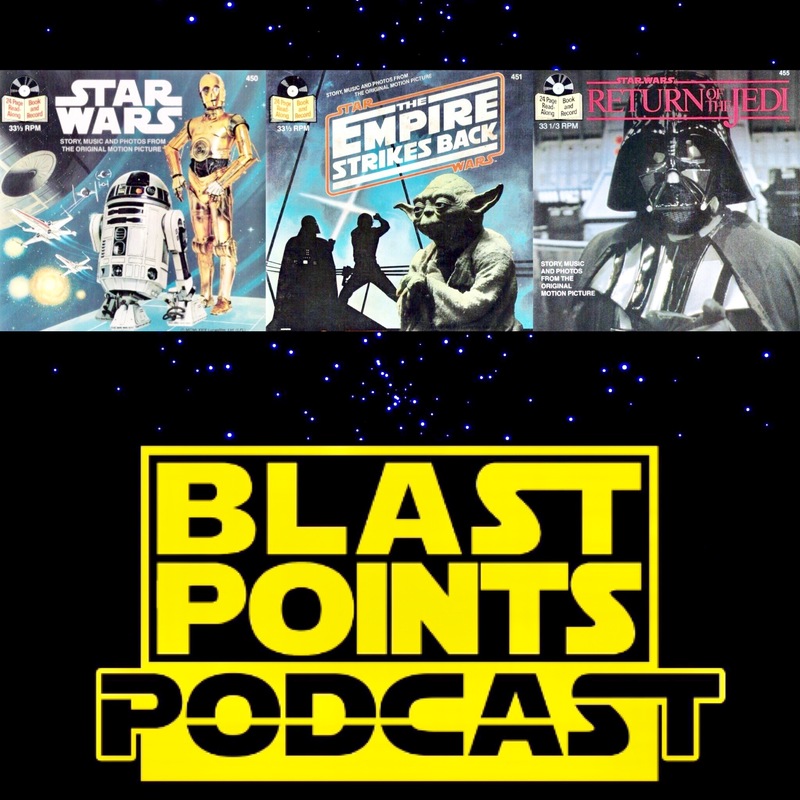 That’s right, join Blast Points this week as they take a close up listen to the the weird, awesome and mysterious Read Along books for the original trilogy! Did they tell the future? Is there a Clone Wars voice connection? How are they connected to Tom Cruise?!! Find out in this laugh filled episode!! Before that there the weekly news with info on our first look at at the main characters in The Last Jedi, Celebration Orlando’s big panel and the latest on your next favorite movie, STAR WORLDS! Get out your record player, listen to BLAST POINTS & celebrate the love!! Jason and Gabe and celebrating Valentine’s Day the only way anyone should and that’s with a tribute to the most romantic person ever in the Star Wars films, Anakin Skywalker! They talk about his most love filled lines and how his gifted Jedi skills also spread into his velvet like way with words. It’s a loving and laugh filled tribute the Chosen One and his carefully chosen talk! Before that, they go over some of the latest news like Judi Dench saying “Reylo”, Han Solo movie casting, upcoming Rebels episodes and the first guest announcements for Star Wars Celebration! Plus, Watto talk and this week’s Bor Gullet mention!! 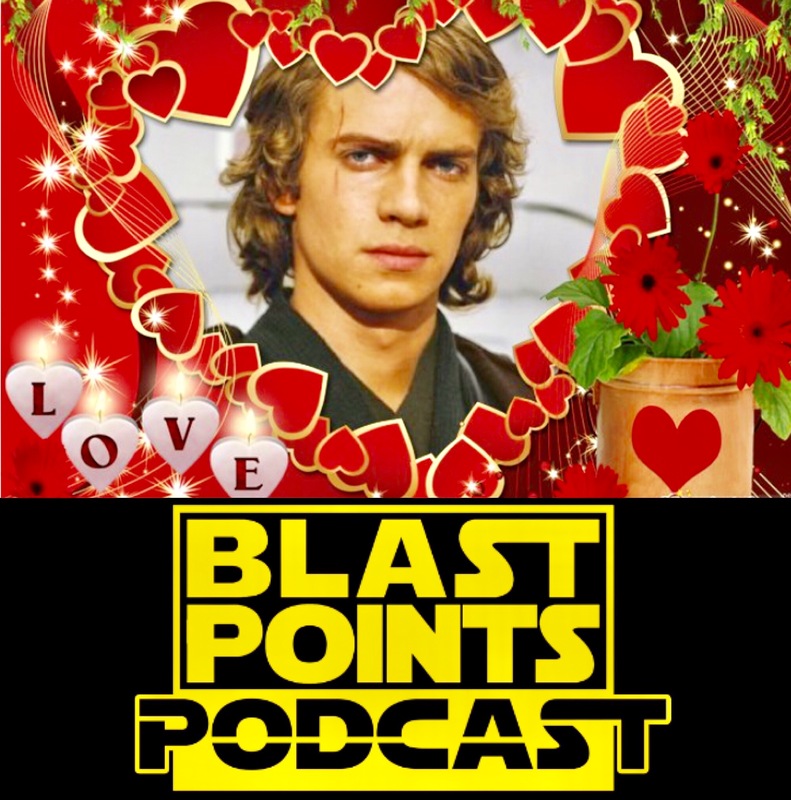 So get out your Barry White record, light some candles, make some space fruit float and celebrate the love with BLAST POINTS!! 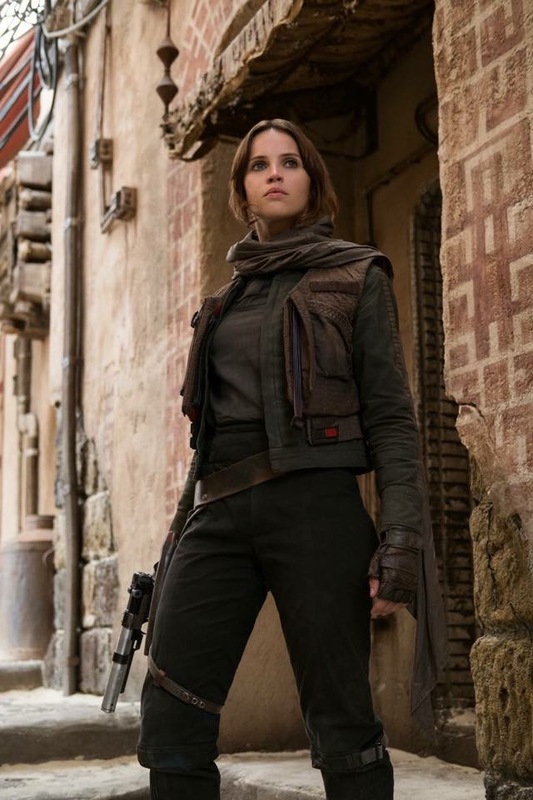 There was a disturbing trend that started around the release of Rogue One with major entertainment journalists writing about how Jyn Erso’s character was left on the cutting room floor or how she lacked personality or wasn’t as strong of a character as Rey and blah and blah and blah. I didn’t understand that then and now that the film has been out for over a month now, that kind of chatter seems to be the new norm amongst a certain percentage of fans out there. 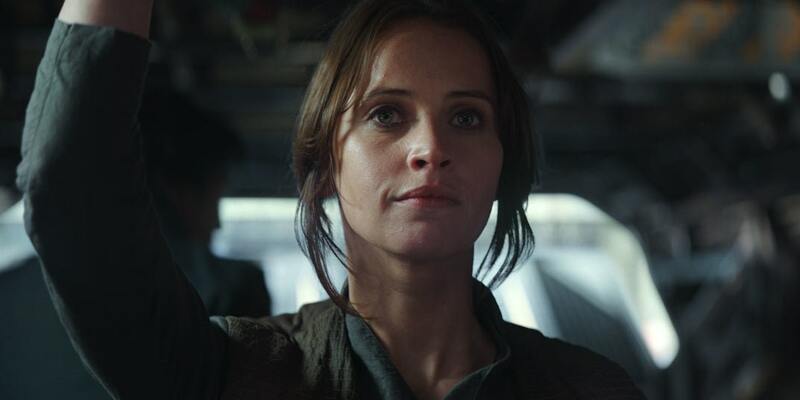 Not only do I not like that icky way of thinking, I would even argue that Jyn Erso is not only a complex and fascinating character, she is one of THE MOST important characters in Star Wars history. Things change once her father befriends an Imperial cargo pilot named Bodhi with the hope that maybe his message of how to destroy the Empire’s destroyer of worlds will get to Saw and just maybe his daughter is still there with him. Within his extremely important message of hope for the galaxy is also a personal message to his daughter if she is still alive. Completing her father’s mission becomes Jyn’s personal quest and she will do it with or without the Rebel Alliance. Her quest of mentally getting back home and repairing the damage done to her family is greater than any of the back and forth of the Empire or the Alliance. 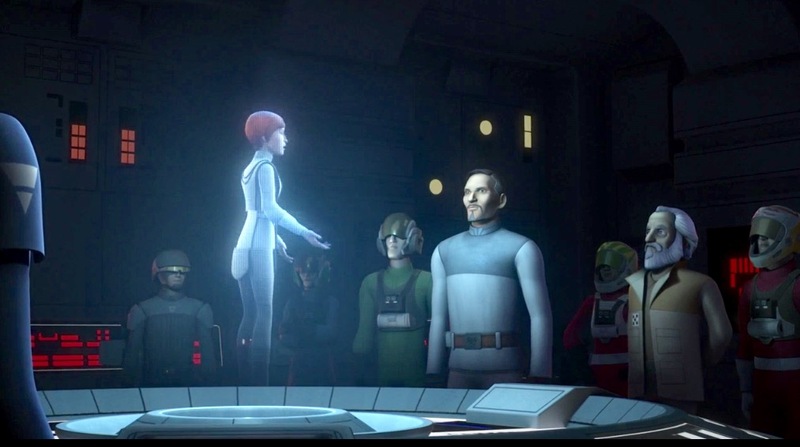 During her passionate speech to the Alliance council, you can see the looks on Mon Mothma and Bail Organa’s faces. Her fire is exactly what the stagnant, fragmented Alliance needs at that moment. After they tell her that a mission to Scarif can’t happen, what does she do? Against the odds, she goes anyways. This is the kind of David vs Goliath attitude that the Rebellion was founded on but had become lost under rules and battling opinions. Mon Mothma’s smile when she is told that Raddus is commanding an attack fleet to Scarif to protect Jyn’s team says it all. Let’s look at Jyn Erso while she is stealing the Death Star plans. Over and over again, it becomes clear for her that there is no getting off Scarif alive in this mission. Even when Cassian is knocked out, Jyn “No Retreat, No Surrender” Erso keeps climbing and shoves herself through a death trap heat vent hole thing. Finally confronted on that catwalk by Krennic, Jyn wastes no time reminding him and herself who she is what she is fighting for. She still may not care for either side of the war that explodes in the sky around her, but she does care about her family that loved her and for what’s the right to do. Had Jyn not begged the uptight Alliance to listen to her and then go off and rebel on her own, the Empire would eventually find Yavin and destroy it. Ben Kenobi & Yoda would grow old alone in their huts on far away planets, Leia Organa would likely be captured and terminated on the Death Star, and the last Jedi would sit on the moisture farm looking up at the sky and wondering what else is out there for him. 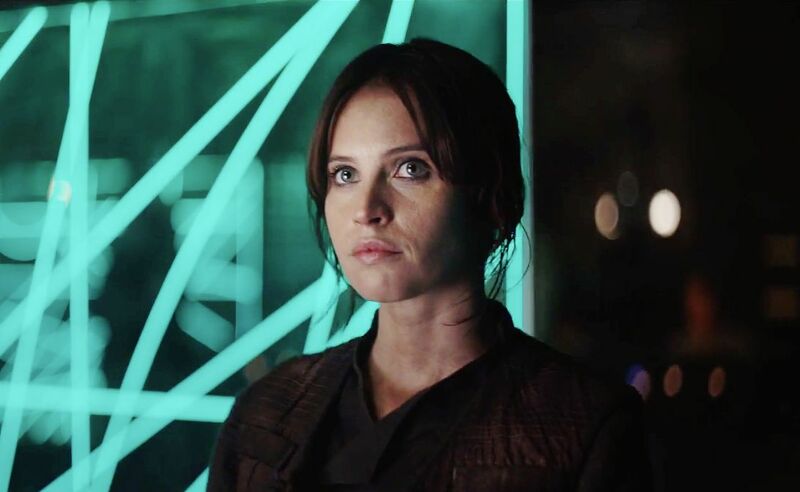 With her compassion and ability to never quit the fight, Jyn Erso not only lights the fire of the Rebel Alliance, she plants the seed that ends up saving the entire galaxy and brings about the return of Jedi. 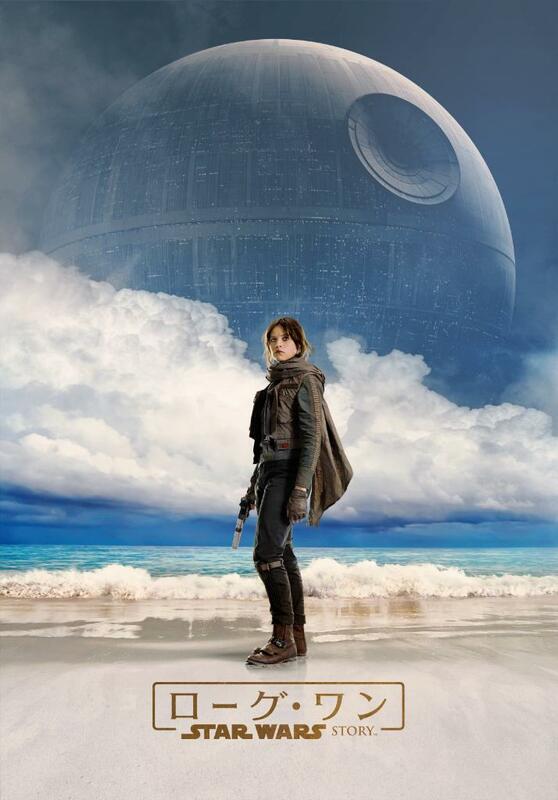 The history books in the Star Wars universe may not have a chapter on the brave Jyn Erso and her unbelievably heroic actions but us viewers of these Journals of the Whills have Rogue One to see just how things went down. The only one who would live to tell the story of Jyn and the daring crew of the Rogue One would be likely Mon Mothma. I would love a story or comic one day as she tells of a passionate criminal daughter of an Imperial scientist who inspired the very spirit of the Alliance that carried forward. Mothma would likely tell the young eager soldiers of the Alliance or the New Republic that everything they have is because of a woman she met once who was named Jyn Erso. People may think that Mothma is just telling a story to inspire others, but we know the truth that often some of the greatest heroes are not the ones who get the medals. 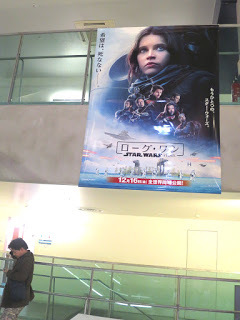 I took a bit of a detour on the way home Friday evening to go see the Japanese dub of Rogue One. This viewing marked the third time I had seen the film, with my previous two viewings being in the original English. Though the movie is doing really well in theaters, it has been tough finding theaters that are doing multiple showings of the dubbed version in the evenings. Fortunately a Japanese user on Twitter provided me with a pretty comprehensive list of theaters in the greater Tokyo area showing the dubbed version, so I was able to make my mission a success. Prior to going to see the film, I did some research on impressions of the dub and the voice actors who handled the characters. One thing that struck me was the number of people who recommended that parents wanting to see the film with their children should go see the dubbed version. Unlike English, where we learn all 26 letters we need to know and the basics for putting them together to form words in our first two years of school, Japanese uses a combination of two phonetic alphabets (which combine for over 100 characters) and Chinese characters (or kanji, with the average person expected to be able to read over 1200 by the end of middle school). Star Wars is filled with lots of specialized sci-fi vocabulary and expressions, many of them including kanji characters kids won’t learn until they are far along in grade school. The daunting task of following along with subtitles that you can only partially read would quickly dim any kid’s enthusiasm, not to mention concentration. In addition, subtitles in Japanese are generally kept short and must eliminate some information in order for people to keep up with the pace of the story. However, a dubbed version spares you all the trouble of reading and allows you to focus nearly entirely on what is transpiring on screen. I was not a big fan of dubs in the past, particularly when it came to anime, but after seeing a number of western films dubbed in Japanese now over the years, I have a greater appreciation for their ability to engage you and help you better experience a movie free of distractions. Ultimately, the success of the dub relies on the quality of the voice actors, and fortunately for the Japanese audience there is a wealth of outstanding voice actors here in Japan. 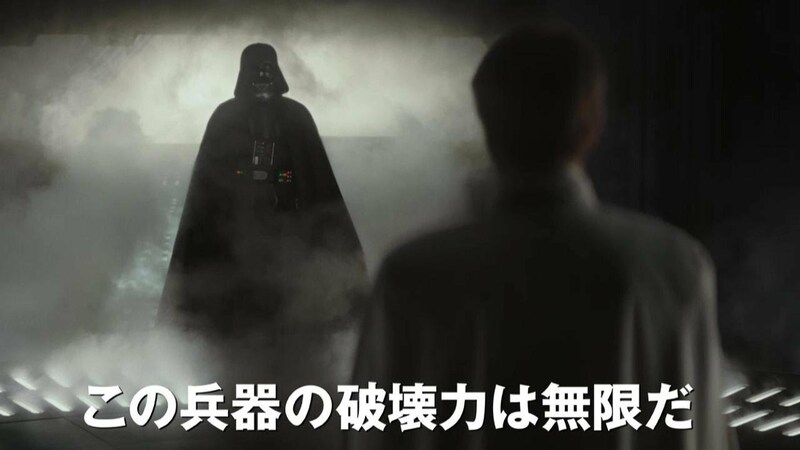 I would say that the Japanese dub of Rogue One did the original justice, so much so that I forgot I was actually watching a dubbed version at times. Here I will introduce the characters, the respective voice actors, and their profiles. Veteran of numerous Western film dubs. Often handles the dubs for Keira Knightley and Rachel McAdams. Popular voice actor known for simply outstanding work. Recent dubs include Dead Pool and Captain America: Civil War. Actor/voice actor that often covers parts acted by Benedict Cumberbatch. Recent dubs include Dr. Strange and Imitation Game. Rogue One marks his SW voice acting debut. Voice actor that specializes in mainly western films and animated features. Has done a lot Disney film dubs, such as Frozen, Toy Story, and Brave. Also has done many of the Marvel films. Another veteran voice actor with an outstanding track record, including Transformers, Frozen, and Disney animated series. Wide-ranging voice actor who has done many Western films and dramas. Possess a dramatic flair that he puts to good use for roles acted by Bradley Cooper and Robert Downey, Jr, as well as Asian stars such as Andy Lau and Hyun Bin. Original Gundam veteran. Often handles roles acted by Alec Baldwin. Voice actor responsible for the dubs of major actresses such as Cameron Diaz, Claire Danes, Kate Winslet, and Mary Lyn Rajskub. Voice actor that has done a number of anime titles. Most recently “appeared” in Independence Day: Resurgence. Has done Forrest Whitaker roles numerous times in the past. Best known for his dub work on the CSI series. Has covered a number of foreign films, dramas, and Japanese anime titles as well. 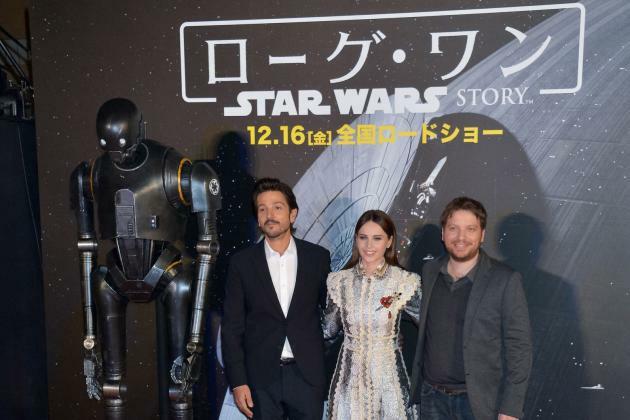 Rogue One marks his first major blockbuster. Voice actress that does primarily anime, Western films, and foreign dramas. Wide variety of work, including the Space Ranger series, Speed series, Ghostbusters, and 007 series. She also did the voice of Mon Mothma in Return of the Jedi. The second person to voice Darth Vader after Toru Ohira. Pretty much handles all of Darth Vader dubs today. He’s done a tremendous job in Rebels. I was fairly impressed with the job that Disney did on the dub for The Force Awakens, but it pales in comparison to the job they did with the dub on Rogue One. As I mentioned earlier, the quality of the dub made me forget that I was actually watching a dubbed version for 95% of the film. 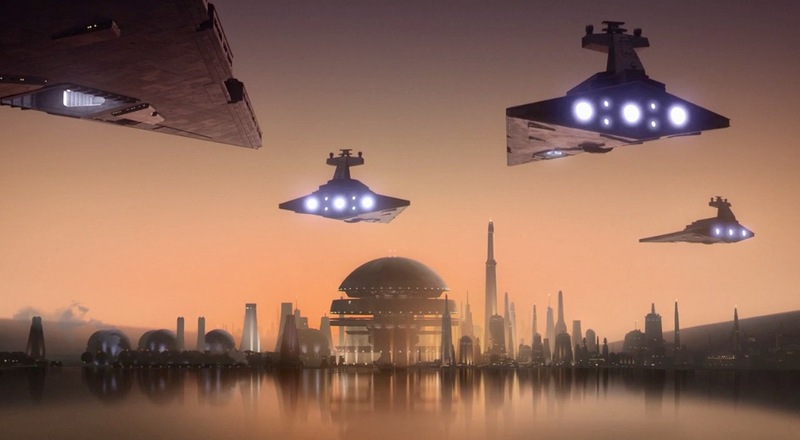 One aspect in which the Star Wars franchise may have an advantage when it comes to dubs is that the films take place in a “galaxy far, far away”, so our willing suspension of disbelief makes it easier for us (or me at least) to further separate what we see on screen from every day life. I knew we were in for a great ride upon taking in that opening dialogue between Galen and Orson. Actors Mikami and Tanaka did a fantastic job of producing the same gravitas as the original characters, but almost perfectly matching the tone and delivery. Galen holding Jyn and then looking at Lyra and saying “Ike (“Go” in Japanese) sounded exactly the same. Time and again throughout the film, I found the Japanese in the dub matching how I imagined things to be translated from English, and that made it all the easier for me to fully immerse myself within the experience. Shibuya’s portrayal of Jyn was excellent, and while the standard Japanese she spoke lacked the atmosphere we get from Jones’s British accent, her voice conveyed all the nuances of the character quite well. Indeed, I could sing the praises of every voice actor, but there are two that I believe are worthy of special attention: Nonaka (K-2SO) and Kirimoto (Bodhi). 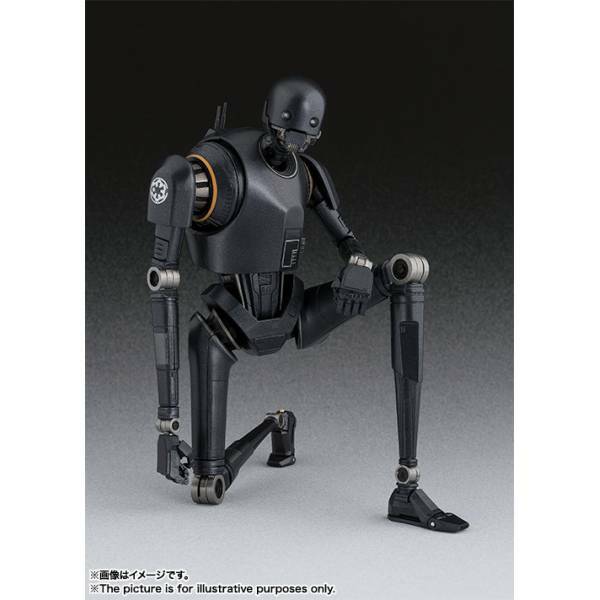 Nonaka’s portrayal of K-2SO was simply sublime, and sounded exactly how imagined the character would have sounded in Japanese. Nonaka produced the same dead-pan delivery that Alan Tudyk perfected for the character, and I found myself laughing at all the same lines as the English original. In a certain sense, the different levels of honorifics used in Japanese helped to further enhanced the character, adding another dimension that made his lines work even better. The language and expressions he used clearly indicate that K-2SO is there to serve Cassian and others, while at the same time the over-the-top politeness made his initial encounter with Jyn all the funnier and goofy. As for Bodhi, Kirimoto’s work on the dub made appreciate that character’s transformation all the more. In fact, and this might sound strange, but the dub left me more impressed with Riz Amed’s performance all the more. His performance provided the template for Kirimoto to work off of, and he did that and more. The sense of confusion and fear when he first meets Saw’s men, the growing confidence he gains as he interacts with the other members of the rogue motley crew, and the ultimate sense of assurance he exudes by the end of the film… each of these small elements were perfectly captured within the dub Japanese, and fully conveyed by Kirimoto’s delivery of the characters’ lines. Well, there you have it. In conclusion, I give the Japanese dub two very big thumbs up, and may choose to watch it again when I take my son for another viewing of the movie (he’s eager to watch it again, and now claims it’s his third favorite of all the films).